Perhaps your great-grandparents added wood ashes to garden soil to provide potash for growing vegetables. Before you do the same, consider a few facts that might have been lost by intervening generations of urban dwellers. A fire burns instide a brick fireplace. Wood ashes from a fireplace, wood stove or other location are highly alkaline and can raise soil's pH level, making it less acidic. Wood ashes can be good for soil, though, when used with care. 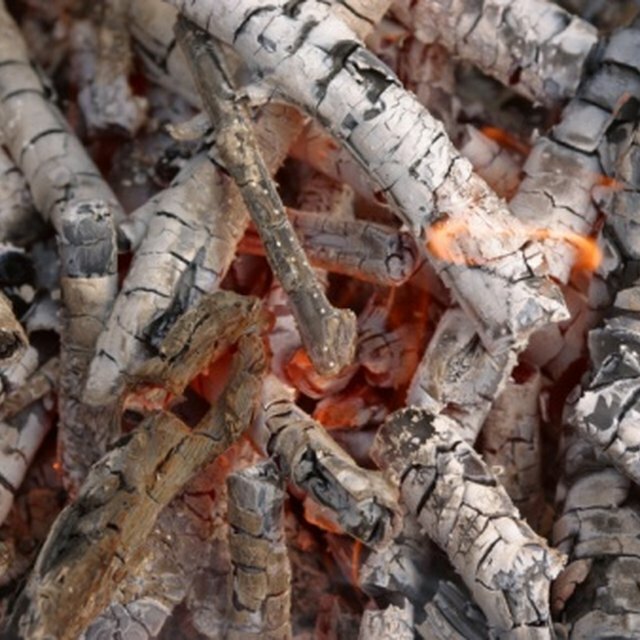 Wood ashes are 25 to 45 percent calcium carbonate, 6 to 10 percent potash, lesser amounts of magnesium in a pastiche of oxides and nearly 22 percent salts. In acidic soil, wood ashes can provide the equivalent of one-half the lime in agricultural limestone or dolomite needed to raise pH. Hardwoods' ashes provide more nutrients than softwoods' ashes. Ashes from sources such as cardboard and treated wood may contain toxic compounds and should not be used. A soil test's results will reveal how much wood ash your garden soil can tolerate. Never use wood ashes for alkaline soil or acid-loving plants. Spread the ashes in thin layers to avoid concentrations of salts in soil. Ashes also help balance high-nitrogen greens' acidity in compost heaps, where their excesses moderate as the heaps mellow. They also deter slugs and snails when scattered around perennial plants but are effective only when dry. Because wood ashes are highly soluble and their salts sink into soil, use them sparingly to repel pests.